As the adoption of cloud computing and consumerisation of IT continues to accelerate, many IT organisations are forced to revisit their traditional security models in order to address the new risks being introduced. This session explores the impact of cloud computing and consumerisation of IT on security and how these emerging trends are reshaping the evolution of identity & access management (IAM), information protection, and compliance-related technologies and architectures. 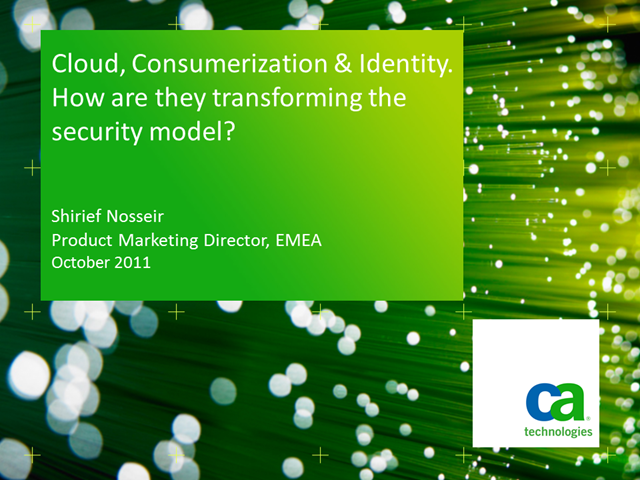 Shirief Nosseir is EMEA product marketing director of security management solutions at CA Technologies. With 25 years in the software industry, Shirief’s experience ranges across the fields of security management, service and infrastructure management, application lifecycle management and business intelligence. This allows him to have insightful understanding of how to assist enterprises in developing business-oriented architectures, while melding traditionally disparate technologies into whole solutions. Shirief is a regular speaker at conferences and educational events and presents frequently on the impact of emerging trends and technologies on enterprise security architectures.